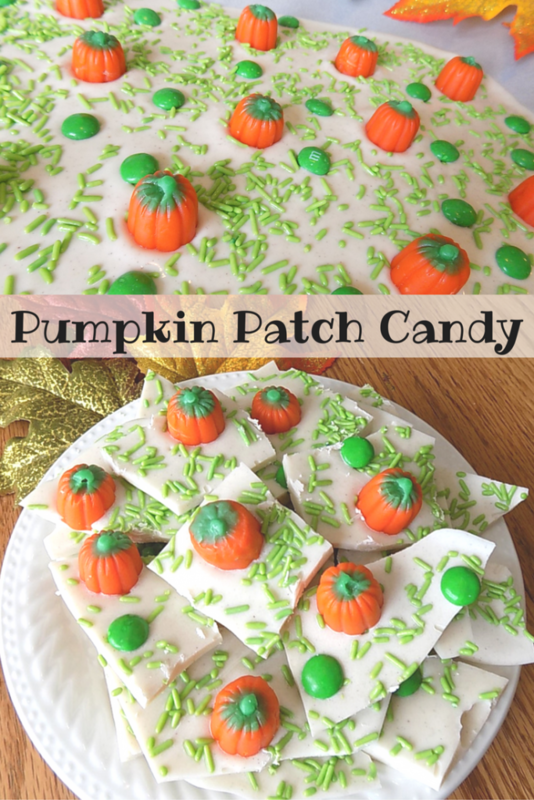 Looking for a super easy and SUPER cute candy to take to the preschool party this Halloween? This pumpkin spice flavored recipe is as cute as it is delicious. This is perfect for any fall gathering or as a fun recipe for kids to make! Place the white chocolate bark in a microwave safe bowl. Heat for 30 seconds and then stir. Continue heating at 15-second intervals until chocolate is completely melted. Do not overcook chocolate or it will scorch. Stir in pumpkin pie spice. Line a 9×13 baking sheet with parchment paper. Pour white chocolate mixture onto the parchment paper and gently shake to spread the chocolate evenly throughout the pan. Before it hardens, place mellowcreme pumpkins on the white chocolate and scatter the sprinkles and green M&Ms over the chocolate. Place in the refrigerator for 1 hour or until candy is hard. Once the candy is hard, break it into pieces and enjoy. 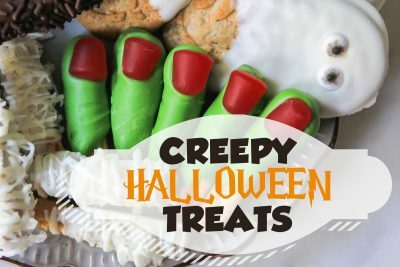 If you liked this recipe, be sure to check out these other freakishly fun and easy Halloween ideas!